With the grace of a dancer, a youthful Orpheus descends into Hades to retrieve his dead wife Eurydice, charming the guardian of the underworld with his poet-musician’s lyre. 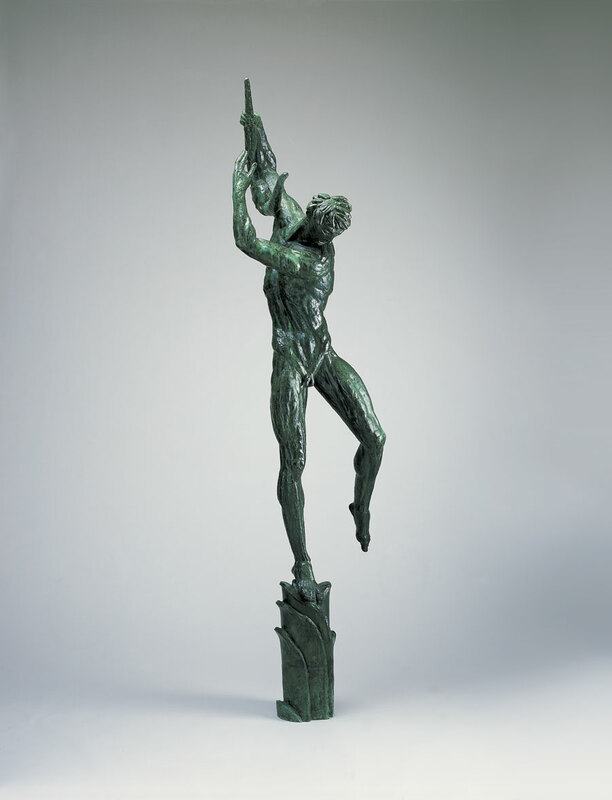 Enlivened by Carl Milles’s characteristic dark green patina and rugged surface, this “sketch” of Orpheus in bronze remembers the softer clay that formed its boyish locks and sinewy muscles. Milles studied sculpture in Paris and was accepted into his first Salon exhibition in 1899. Shortly thereafter he worked in the studio of Auguste Rodin. Milles won a sculptural competition for the Stockholm Concert Hall with this exuberant interpretation of the Orpheus myth. The completed monument includes eight figures, their heads slightly cocked as they strain to hear his music. Another casting of the eight figures was installed as the Orpheus Fountain at Cranbrook in 1938 where the harmonious sounds of splashing water evoke the songs of the absent Orpheus. Milles came to Cranbrook to head the sculpture department in 1931 and remained until 1951. He sculpted the final Stockholm Orpheus in his Cranbrook studio.